Designer Enrico Gobbi has exclusively revealed to Boat International the details of his new Ketos 53m concept, which encases enviable interior space in a sleek, sporty superstructure. 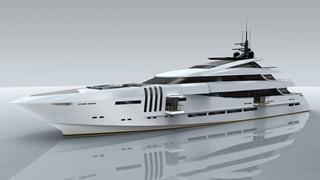 Gobbi was asked to design the three-deck concept by the Rossi Navi shipyard in Viareggio, for which he designed the 48m Ketos (currently under construction). ‘The yard wanted a lot of interior space, many square metres, but in a very sleek design – this compromise was a central point of this project,’ says Gobbi, of Team For Design by Enrico Gobbi. This promise of speed is fulfilled in the yacht’s high-performance hull. A blade-shaped bow enables the Ketos 53 to run between the waves effectively and gain speed, even in the lower performing of the two versions available. Innovation continues with the design of the interior, which features large windows throughout and exterior side pillars made of glass to interrupt views as little as possible. The yacht can accommodate 16 guests in 7 cabins. Powered by twin Caterpillar 1,939kw engines, the displacement version of this superyacht has a cruising speed of 15 knots (half standard load) and a top speed of 16.5 knots (half standard load). The semi-displacement option, with twin MTU 2,720kw or 3,440kw engines, offers top speeds of 21 or 23 knots respectively.